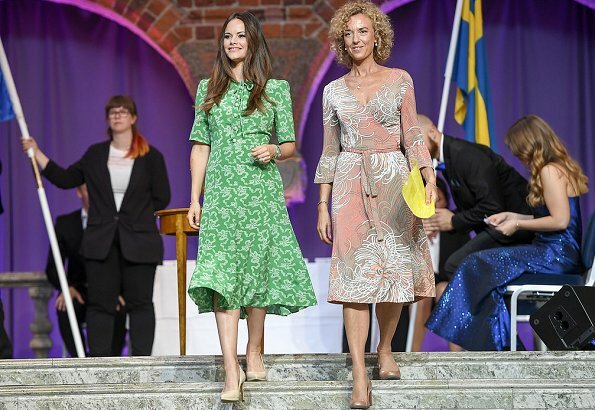 On June 11, 2018, Princess Sofia of Sweden attended Sophiahemmet's graduation ceremony held at Stockholm City Hall in Stockholm. 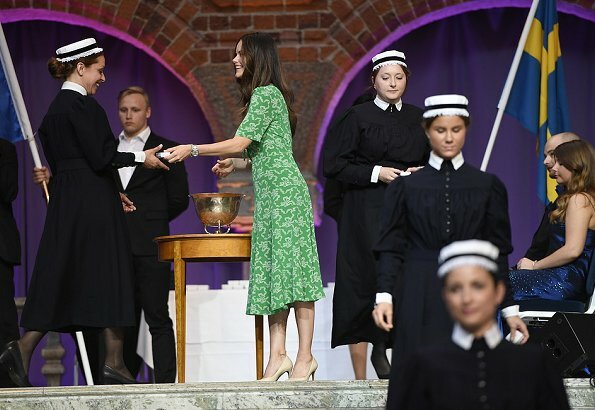 Princess Sofia presented graduation brooches to the nurses who completed their education at Sophiahemmet University. 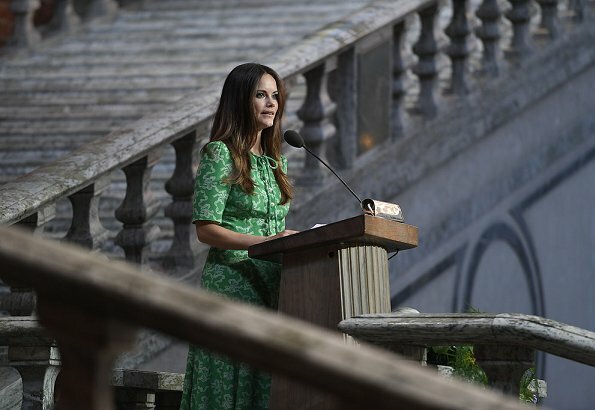 Princess Sofia is the honorary president of Sophiahemmets non-profit organization. 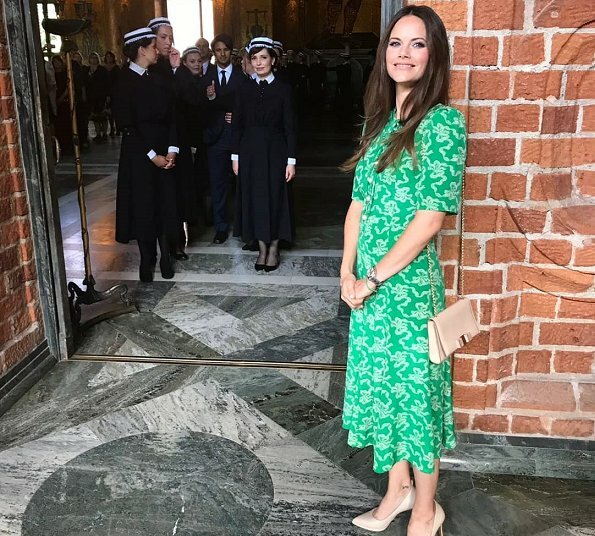 Princess Sofia wore a new green montana silk dress from LK BENNETT. Princess Sophiaof Sweden looks very beautiful. Green is a great colour on Sofia, it really suits her. I like the dress but the pattern...not so much. Anyway Sofia looks great and confident! Pss Sofia looks great,this is a very nice color on her. Her smile is very nice to. Good job Sofia. I love floral patterns! The design is not bad but this pattern is. Her makeup is too heavy. Makes her look weird. The acessories are very nice though. Very lovely feminine dress that is vintage-inspired, yet, looks modern. Green suits her coloring. I think she would rock shoulder length hair much better than her current layered style. She looks great - love the dress. She could maybe do with a bit of a trim on the ends of her hair, but this is a nice appearance. Cut and colcor is good for Sofia, pattern not so much, lokks like worms ore something :-)) I prefer the dress of the blonde lady in cut and color, also the pattern is much mor interesting. P.S. Sofia needs a hair cut, her hair is too long and ends look spli. Princess Sofia is looking glamorous. Nice Make-up, her smile is lovely and this green dress flatters her so good. Most of floral pattern dresses age the women but this doesn't do it. Wow, Princess Sofia looks wonderful. The cut and the colour of the dress suits her very well. A lovely dress, and the shade of green is beautiful. Sofia looks very good. Lovely this time.She looks very happy and relaxed. This looks like straight from the 70s. I like a good retro look, but this is beyond retro. This looks dated. The blush pink dress on the other lady is gorgeous. Lovely dress, very flattering colour, accessories great too.